We are deals in Kirloskar Green Koel Silent Genset. Acoustic Enclosures are most trusted and reliable alternative to sound problems. We are instrumental in manufacturing and exporting the Silent Diesel Generators for our valued clients. These generators are known for offering zero leak engines. 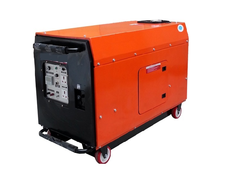 Owing to their compact and low vibration, our provided generators have the smallest footprint. Also, these generators are fully configured with the microprocessor.